Anyone know what the craic is? It’s confirmed. They told me at the booze shop today. Going up 30% on the 15th. Eurostar Cellar in Ghantoot told me it's nonsense and there's no change, however this photo is doing the rounds. stocked up for the summer just incase though. How much does it cost anyways? For e.g. bottle of Grey Goose or bottle of Red Label? Just in Abu Dhabi, to bring it in line with Dubai. Yup, just heard this too. 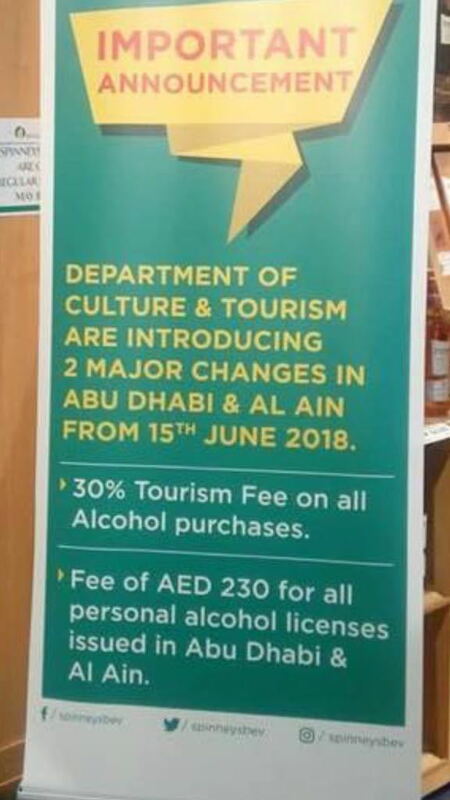 Apparently AD is currently 25% whereas Dubai is 30%.... as such its not a 30% increase. As you were chaps and chapesses! eh no....I checked with manager in peninsula when i was in getting weekend stocks. Confirmed currently no tax on booze in AD, so prices going up by 30% from 15th June. Are you sure? The current prices either have a tax, or an equivalent markup. E. G. A £8 bottle of Casillero del Diablo is around 70-80 dhs. If a new 30% tax was applied then the price would go up to 90+ dhs. Which is c. 200% higher than the UK. If you're right and an additional 30% price increase were actually to happen then i suspect people will just down shift to the next level of cheaper drinks that prices up to the same net price after tax. Double the UK price is about standard anyway. £50 (AED 250) for a case of 24 beers is more or less standard already, that'll be going up 30%. I think I'll just be buying less rather than downgrading to Red Horse beer and Ambassador Whisky from India. This article would suggest it's a full 30% increase on all retail sales in AD - not some move from 25-30%. It's a new additional levy.